Genevac has published data which shows how Heat Transfer Plates improve evaporation results when drying microplate samples, by improving the flow of heat to the product. A major factor in determining the speed of evaporation is the rate at which heat enters the sample. As well as the temperature of the heat lamps or thermal medium, the thermal conductivity of any materials in between must also be taken into consideration. Removing solvents such as DMSO or water from microplates has traditionally been time-consuming because of the poor thermal contact of the microplate with the evaporator sample holder. 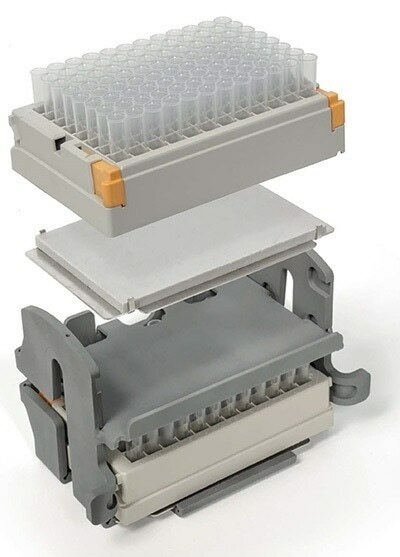 Genevac heat transfer plates overcome this problem, acting as a snugly fitting insert beneath the microplate, facilitating efficient thermal energy transfer from the hot outer surface of the sample holder directly to the walls of the microplate. Beneficially Genevac heat transfer plates accelerate your microplate sample rapid evaporation rate without the risk of overheating fast drying samples. Using Genevac heat transfer plates in conjunction with an HT Series or EZ-2 evaporator is shown to reduce microplate evaporation times by up to 50%.